There are few pleasures in life that come close to the feel of sand between your toes and turbulent salt water of the surf rushing around your legs on a frosty winters morning, at least for a fanatical beach fishing enthusiast such as myself. Yes I concede we are a different breed of fisherman, with varying degrees of insanity ranging from those that wear waders to ward off the elements or stand on the dry beach sand when casting to others that approach fully certifiable by wading chest deep and higher onto surf pounded banks at night in order to gain those extra few metres of casting distance to reach the big ones. Beach fishing for the fanatical surf fisherman is a primal pursuit, hunting his prey in the fishes own element, searching out accessible areas where he knows his target resides, then planting a tempting morsel right in front of his nose. All this while at times surrounded by the sound of crashing waves and shifting sand, watching gulls, terns, sea hawks and eagles at work, watching playful dolphins and whales frolic in and beyond the waves and predatory fish go about their daily lives of eating and being eaten. Totally natural surroundings where the worries of the world have no place and ones focus is firmly centered on our first love, fishing. Although there are additional draw cards on the beach namely for those of us that surf and those of us that have kids that love to play on the beach. The chance to have a holiday on the beach, put a smile on the children's face and wet a line at the same just can't be overrated. Add the that the chance of putting a fresh feed of fish on the dinner table and you have wonder whether heaven could be better than this. But lets not get ahead of ourselves we have a bit to learn first. A surf beach is a barren place on the whole, miles and miles of open water, foam covered banks and crashing shore breaks giving the inexperienced person little indication of what the waters may hold. No chart can keep up with the changing contours and water depths that results from millions of tons of sand being removed from one area to be replaced in another by tidal surges, wave motion and rips. Depth sounders and fish finders have no place here either, all of the modern fish finding devices and aids have no use in this environment, so unless we want to fish blindly then we have to fall back on the old Mark1 eyeball. So what is the secret to beach fishing? Observation! Visually identifying structure is the way to go on a surf beach. 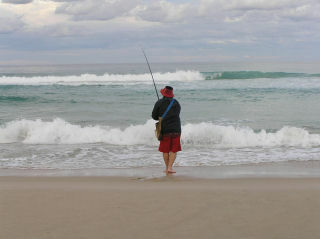 Knowing how to identify banks, gutters, drains and rips becomes essential if you hope to regularly catch fish from the beach. Additional observations of swooping birds and for the more experienced, identifying bait fish and the species of fish we wish to target will give you the edge over 99% of other fishermen. There are several major factors involved in successfully fishing the beach so I will break each up into their own page and where possible focus on specific species.